پیوستگی بین سنگدانه و خمیر سیمان موسوم به ناحیه انتقال میان سطحی (ITZ) از پارامترهای مهمی است که بر خواص مکانیکی و دوام بتن تاثیر می­گذارد. ریزساختار ناحیه انتقال و تخلخل (حفرات) خمیر سیمان و بتن متاثر از نوع و خواص مصالح مصرفی است که بررسی آن از اهداف این تحقیق می باشد. از طرفی استفاده از روش­های کارآمد، کم هزینه و قابل اتکا برای ارزیابی عملکرد بتن در برابر نفوذ یون کلراید و رابطه آن با ناحیه انتقال، به عنوان معیار مناسب برای ارزیابی دوام، اهمیت ویژه­ای دارد. تاکنون روش­های مختلفی با رویکرد شاخص­های الکتریکی ارائه شده است. در این پژوهش، تاثیر مواد پوزولانی خاکستربادی (10%، 20% و 30%) و دوده سیلیسی (5% و 10%) به عنوان جایگزین با وزن سیمان به صورت مخلوط­های دوجزیی و سه­جزیی، بر خواص بتن تازه و سخت شده مورد بررسی قرار گرفته است. از آزمایش های مقاومت فشاری، مقاومت کششی غیر مستقیم و مدول الاستیسیته برای ارزیابی خواص مکانیکی استفاده شد. همچنین برای ارزیابی دوام بتن، آزمایش­های عمق نفوذ آب، تخلخل، جذب آب موئینه، مقاومت الکتریکی ویژه، نفوذ تسریع شده یون کلراید (RCPT)، انتقال تسریع شده یون کلراید (RCMT) بکار برده شد. جهت بررسی ریخت شناسی مرز مشترک سنگدانه و خمیر سیمان از تصاویر ریزنگار الکترون پویشی (SEM) استفاده شد. نتایج آزمایش بر روی بتن تازه نشان داد که حضور دوده سیلیسی در مخلوط های دوجزیی و سه­جزیی موجب کاهش کارایی و هوای محبوس و حضور خاکستر بادی موجب افزایش این دو می­شود. افزودن دوده سیلیسی به مخلوط­های حاوی خاکستربادی ضمن افزایش مقاومت مکانیکی، موجب کاهش تخلخل و حفرات تا 18% می­شود. همچنین حضور مواد پوزولانی علاوه­بر افزایش کیفیت پیوند و یکنواختی مرز سنگدانه با خمیر سیمان، به طور چشمگیری بر خواص انتقال بتن تاثیر مثبت می­گذارد. The bond between aggregate and cement paste, called the interfacial transition zone (ITZ) is an important parameter that effect on the mechanical properties and durability of concrete. Transition zone microstructure and porosity (pores) of cement paste or concrete are affected by the type and properties of materials used which evaluated in this research. On the other hand, the use of efficient, low-cost and reliable method is particularly important for evaluating of concrete performance against the chloride ion penetration and its relationships with transition zone as a suitable index to assess the durability. So far, various methods to approach the electrical Indices are presented. In this research, the effect of pozzolanic materials fly ash (10%, 20% and 30%) and silica fume (5% and 10%) as substitute of cement by weight in binary and ternary mixtures on the fresh and hardened concrete properties were investigated. To determine mechanical properties, the compressive strength, splitting tensile strength and modulus of elasticity tests were performed. Also, water penetration depth, porosity, water sorptivity, specific electrical resistivity, rapid chloride penetration test (RCPT) and rapid chloride migration test (RCMT) tests were applied to evaluate concrete durability. To examine the border of aggregate and cement paste morphology of concrete specimens, scanning electron microscope images (SEM) was used. The fresh concrete results showed that the presence of silica fume in binary and ternary mixtures reduced workability and air content but fly ash increased them. Adding silica fume to mixtures of containing flay ash while increasing mechanical strength reduced the porosity and pores to 18%. The presence of pozzolanic materials in addition to increasing bond quality and uniformity of aggregate-cement matrix border a considerably positive effect on the transport properties of concrete. de Sensale, G. R. (2006). Strength development of concrete with rice-husk ash. Cement and concrete composites, 28(2), 158-160. Khan, M. I., and Siddique, R. (2011). Utilization of silica fume in concrete: Review of durability properties. Resources, Conservation and Recycling, 57, 30-35. Locher, F.W., 2006. Cement: principles of production and use. Verlag Bau und Technik, 30-34. Leung, H. Y., Kim, J., Nadeem, A., Jaganathan, J., and Anwar, M. P. (2016). Sorptivity of self-compacting concrete containing fly ash and silica fume. Construction and Building Materials, 113, 369-375. Wu, K., Shi, H., Xu, L., Ye, G., and De Schutter, G. (2016). Microstructural characterization of ITZ in blended cement concretes and its relation to transport properties. Cement and Concrete Research, 79, 243-256. Sezer, G. İ. (2012). Compressive strength and sulfate resistance of limestone and/or silica fume mortars. Construction and Building Materials, 26(1), 613-618. Papadakis, V. G. (2000). Effect of supplementary cementing materials on concrete resistance against carbonation and chloride ingress. Cement and concrete research, 30(2), 291-299. Sun, Z., Garboczi, E. J., and Shah, S. P. (2007). Modeling the elastic properties of concrete composites: Experiment, differential effective medium theory, and numerical simulation. Cement and Concrete Composites, 29(1), 22-38. Maruyama, I., Sasano, H., and Lin, M. (2016). Impact of aggregate properties on the development of shrinkage-induced cracking in concrete under restraint conditions. Cement and Concrete Research, 85, 82-101. Liao, K. Y., Chang, P. K., Peng, Y. N., and Yang, C. C. (2004). A study on characteristics of interfacial transition zone in concrete. Cement and Concrete Research, 34(6), 977-989. Scrivener, K. L., Crumbie, A. K., and Laugesen, P. (2004). The interfacial transition zone (ITZ) between cement paste and aggregate in concrete. Interface Science, 12(4), 411-421. Wang, Y., Jin, F., and Xie, Y. (2016). Experimental Study on Effects of Casting Procedures on Compressive Strength, Water Permeability, and Interfacial Transition Zone Porosity of Rock-Filled Concrete. Journal of Materials in Civil Engineering, 28(8), 04016055. Wong, H. S., Zobel, M., Buenfeld, N. R., and Zimmerman, R. W. (2009). Influence of the interfacial transition zone and microcracking on the diffusivity, permeability and sorptivity of cement-based materials after drying. Mag. Concr. Res, 61(8), 571-589. Jiang, Z., Huang, Q., Xi, Y., Gu, X., and Zhang, W. (2016). Experimental study of diffusivity of the interfacial transition zone between cement paste and aggregate. Journal of Materials in Civil Engineering, 28(10), 04016109. Breton, D., Ollivier, J.P., Ballivy, G. and Maso, J.C., (1992). Interfaces in cementitious composites. In RILEM International Conference, Toulouse. Pilvar, A., Ramezanianpour, A, A., and Rajaie, H. (2017). Experimental Assessment of Electrically Accelerated Chloride Permeability Tests for Concrete. Concrete Research, 9(2), 5-15. Zheng, J. J., & Zhou, X. Z. (2013). Effective medium method for predicting the chloride diffusivity in concrete with ITZ percolation effect. Construction and Building Materials, 47, 1093-1098. Pilvar, A., Ramezanianpour, A. A., and Rajaie, H. (2016). Comparison of Four Electrical Measurement Methods with Bulk Diffusion for Assessing the Chloride Resistance of Concretes. 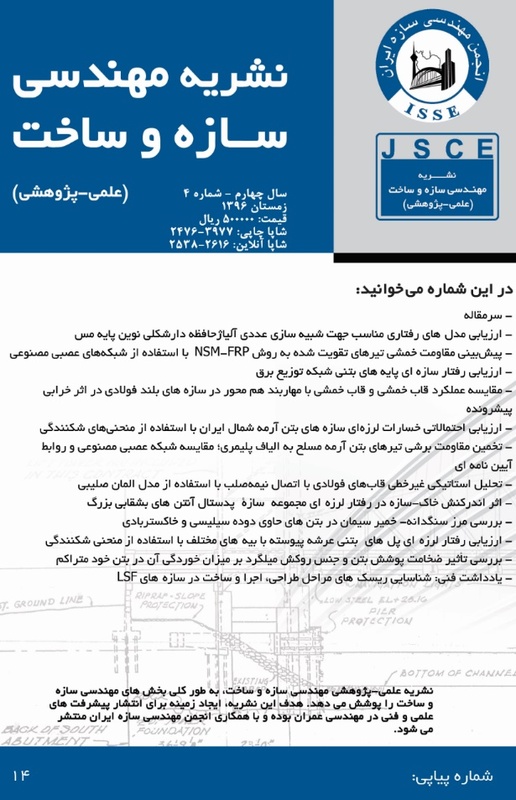 Iranian Journal of Science and Technology, Transactions of Civil Engineering, 40(4), 327-336.
migration procedure. TP64, Washington, DC. NT Build. (1999). Concrete, mortar and cement-based repair materials: Chloride migration coefficient from non steadystate migration experiments. Build492, NORDTEST, Espoo. Finland. Bagheri, A. R., and Zanganeh, H. (2012). Comparison of rapid tests for evaluation of chloride resistance of concretes with supplementary cementitious materials. Journal of Materials in Civil Engineering, 24(9), 1175-1182. Ramezanianpour, A. A., Karein, S. M. M., Vosoughi, P., Pilvar, A., Isapour, S., and Moodi, F. (2014). Effects of calcined perlite powder as a SCM on the strength and permeability of concrete. Construction and Building Materials, 66, 222-228. Carlsson, B., Frei, U., Köhl, M., and Möller, K. (1994). Swedish National Testing and Research Institute (No. 1994, p. 13). Report. Zhang, M. H., and Islam, J. (2012). Use of nano-silica to reduce setting time and increase early strength of concretes with high volumes of fly ash or slag. Construction and Building Materials, 29, 573-580. Mounanga, P., Khokhar, M. I. A., El Hachem, R., and Loukili, A. (2011). Improvement of the early-age reactivity of fly ash and blast furnace slag cementitious systems using limestone filler. Materials and Structures, 44(2), 437-453. Shekarchi, M., Bonakdar, A., Bakhshi, M., Mirdamadi, A., and Mobasher, B. (2010). Transport properties in metakaolin blended concrete. Construction and Building Materials, 24(11), 2217-2223. Vollpracht, A., Lothenbach, B., Snellings, R., & Haufe, J. (2016). The pore solution of blended cements: a review. Materials and Structures, 49(8), 3341-3367. Buenfeld, N. R., Glass, G. K., Hassanein, A. M., & Zhang, J. Z. (1998). Chloride transport in concrete subjected to electric field. Journal of Materials in Civil Engineering, 10(4), 220-228. Whittington, H. W., McCarter, J., and Forde, M. C. (1981). The conduction of electricity through concrete. Magazine of concrete research, 33(114), 48-60. Christensen, B. J., Coverdale, T., Olson, R. A., Ford, S. J., Garboczi, E. J., Jennings, H. M., and Mason, T. O. (1994). Impedance Spectroscopy of Hydrating Cement‐Based Materials: Measurement, Interpretation, and Application. Journal of the American Ceramic Society, 77(11), 2789-2804. Nokken, M. R., & Hooton, R. D. (2006). Electrical conductivity testing. Concrete international, 28(10), 58-63. Snyder, K. A., Feng, X., Keen, B. D., & Mason, T. O. (2003). Estimating the electrical conductivity of cement paste pore solutions from OH−, K+ and Na+ concentrations. Cement and Concrete Research, 33(6), 793-798. Nokken, M., Boddy, A., Wu, X., and Hooton, R. D. (2008). Effects of temperature, chemical, and mineral admixtures on the electrical conductivity of concrete. Journal of ASTM International, 5(5), 1-9.